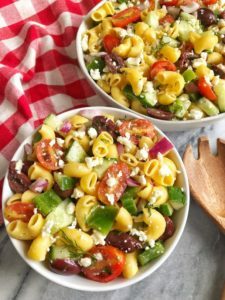 This Healthy Greek Pasta Salad would be the perfect side dish for your summer picnic! Made with gluten-free pasta and a light vinaigrette! 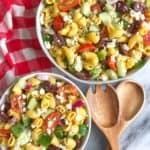 Does pasta salad remind anyone else of summer barbecues, eating off paper plates, and letting all of your baked beans, ketchup, mustard, and hamburger run together? I don’t know if it is just me, but summertime eats were my absolute favorite. 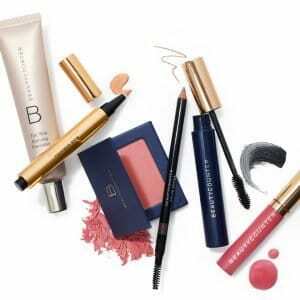 I lived in a big suburban neighborhood with tons of other families and it seemed like almost every weekend, we would be eating dinner outside at someone’s house, playing in the backyard while the parents relaxed on the deck. I remember running around catching fireflies, swimming until it was time to put the pool light on, and then only leaving the water when we heard the ice-cream man. Summers were the best and those memories will live with me forever. I specifically remember how much food we had too – there was never a shortage of that. Burgers, hot dogs, baked beans, corn-on-the-cob, watermelon, and of course my mom’s pasta salad. She made a mean Italian pasta salad that I vividly remember eating almost every single fourth of July! 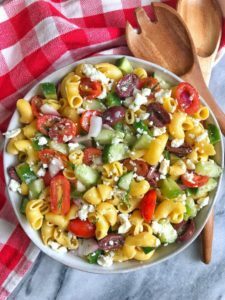 In honor of the summer coming up, I wanted to create a deliciously healthy pasta salad and since I have been loving Greek food, I thought it would be fun to make a Greek version. Cook pasta according to box and drain. Chop all veggies and combine in a large bowl. Add fresh dill and stir. Add pasta to veggies, then pour dressing over top. Stir to combine. Add feta cheese and let sit at least 1 hour. Disclaimer, Ancient Harvest provided promotional consideration for my participation in this program.